Spotlight : valentiens Treat has come to an end and it's time to announce the theme for the this month. I'll post teh round-up of Valentine's Treat very soon. For this month, I thought to put our Spotlight on some unique and exotic spices of Indian cuisine, like, saffron, mace, nutmeg, and so on. To start the whole series, one spice came to my mind which is not so known to every Indian, still it has lot to offer and that spice is Panch Phoron. 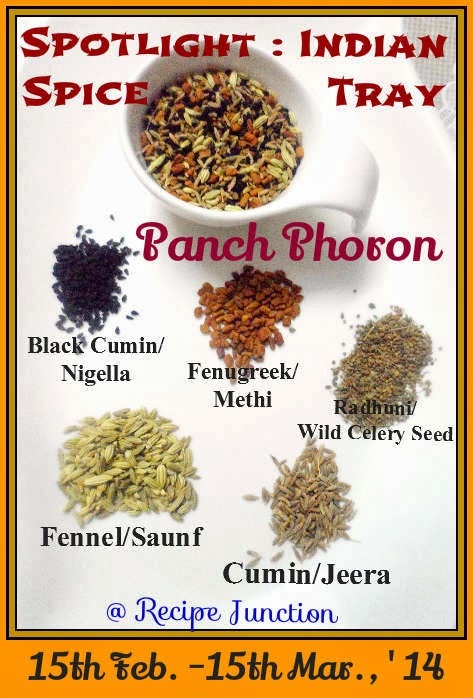 Panch Phoron is a blend or mixture of five basic spices from Indian Cuisine, Cumin(jeera), black Cumin(kala jeera/nigella seed), Fenugreek Seeds(methi), Fennel seed(saunf/mouri) and Wild celery seed(Radhuni in Bengali). Radhuni is replaced by mustard seeds in some variations, but in Bengal, radhuni or wild celery seeds is used in Panch-phoron. All these five spices play as a perfect team and when it is used in a dish, adds an unique flavour to the dish. If you have not cooked with these unique spice blend, please do it ASAP, otherwise you are missing something. It is a must in all Bengali households and also widely used in other Eastern states of India, like in Assam and Oriya and also in Bangladeshi Cuisine. So, I am asking my fellow bloggers to cook something with this Unique spice mixture. 1. Prepare any dish from any course with this spice blend as the main spice ingredient. Veg and Non-Veg. both are allowed. 2. Post it in your blog between 15th Feb,'14 to 15th March, 2014. Archived posts are allowed but should be linked with this announcement page and the logo. 3. All posts should include this announcement link and the logo. The use of use is mandatory as it helps to spread the word. 4. Non-bloggers can also send their recipes. Send your recipes to below mentioned email address with a picture.